In just a few weeks, a new gathering spot will open on 14th Street in Midtown between Spring and West Peachtree, boasting pop-up food carts, a coffee-and-wine bar, sunrise yoga on the roof, a bike tune-up area, a build-your-own avocado toast bar, giant Jenga, and more. But it’s not a new food hall or an entertainment complex, per se. It’s a grocery store. 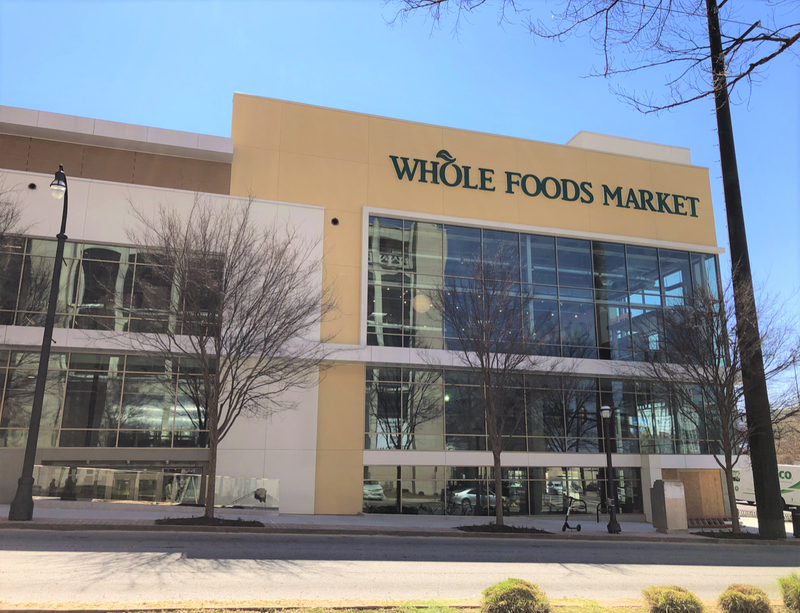 The new 70,000-square-foot flagship Whole Foods—the largest in the Southeast—officially opens April 5 at 22 14th Street Northwest, and will not only bring new lunch options for Midtown workers, but will signal the closure of another Atlanta location and pave the way for the chain’s regional headquarters to move just a few blocks over. Here’s what to expect. The new Whole Foods Midtown at the corner of 14th and Spring Streets. Whole Foods has received a lot of attention of late. The organic grocery chain, which was purchased by Amazon in 2017, decided in January it would discontinue its line of more budget-conscious 365 stores. But the Buckhead and Decatur 365 stores had opened just a month earlier. So what’s their fate? Whole Foods Market Regional President Bobby Turner says there’s no set timeline to close or convert those locations to traditional Whole Foods Markets. “Those stores are barely 90 days old. We’re still trying to figure out what works right now. They are open and serving their communities and will continue to do so,” he says. But changes are coming to the company’s first Atlanta store on Briarcliff Road, too. A few days before Whole Foods Midtown opens, the Briarcliff store will close for good. Whole Foods is also moving its regional headquarters in town. Currently housed in Roswell, the near-100-person team will relocate to Colony Square in 2020. “We really wanted to move to an area where we can recruit new, young talent, and we want it close to the airport for people who fly in for meetings,” Turner says. (The company is headquartered in Austin, Texas.) “It’s all about being around food and close to the new store.” As a bonus, the new space will have a test kitchen, he says. The Midtown store has historical significance for the company, too, as the 500th store worldwide. Located in the newly constructed Icon apartment building, it features three levels of parking, a self-serve bike tune-up area, and multiple entrances—each with a different community area. “We made sure every entrance had activity going to create connection,” Turner says. To kick off the excitement on opening day—Friday, April 5—Whole Foods Midtown will provide free coffee and pastries starting at 6 a.m. (The store officially opens at 7 a.m.) There will be live music, and the first 500 customers in line will receive a tote bag with any purchase. In addition, the first 150 people in line Friday through Sunday will each receive a gift card with an amount ranging from $5 to $100. “Each floor has a different feel, incorporating the history of Midtown into the design element,” Turner says. Here’s a floor-by-floor breakdown. P2: In addition to more garage parking, expect a counter-service restaurant with details to be announced in the future. P1: In the garage, there’s even more parking. Inside the store, there’s what Turner hopes will be a gathering spot, called Capital Commons. It’s an Allegro coffee and espresso bar, with wine, local beer, sandwiches, and baked goods available. It will have seating for 60 people. L1: The street level features a beer and wine bar called 14th Street Bar, a juice bar, and a screened-in patio area with free Wi-Fi that was inspired by the Dancing Goats at Ponce City Market. There’s even a balcony for dining and people-watching. There will be kiosks for ordering breakfast bowls, parfaits, and grain bowls, along with pop-up food carts that will feature rotating lunch menus. On opening day, those food carts will feature kettle corn, maple butter chicken biscuits, fish tacos, and toasted raclette cheese sandwiches. This is also where the actual grocery is located. 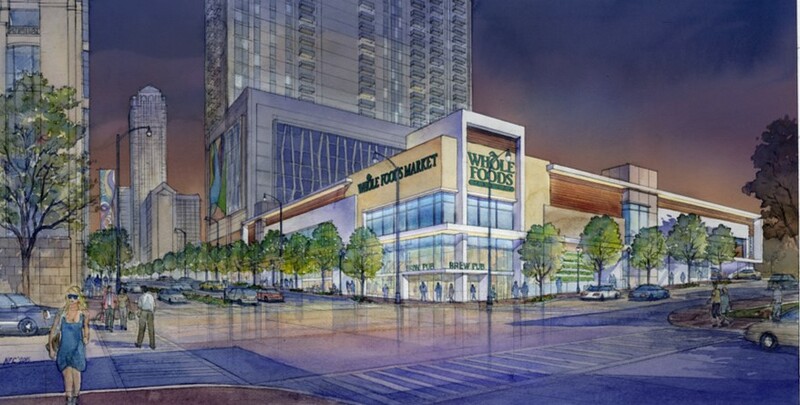 There will be 1,500 local items, some of which are exclusive to Whole Foods Midtown. These include a peach praline popsicle from King of Pops, cucumber lemonade from Arden’s Garden, and banana pudding marshmallow from Malvi. There will be a Pacha Soap boutique, and a “veggie butcher” to julienne your vegetables and chop your fruit. “This level will be very bright. There are windows in [the] produce [section] and paintings of Colony Square and the Midtown skyline,” Turner says. 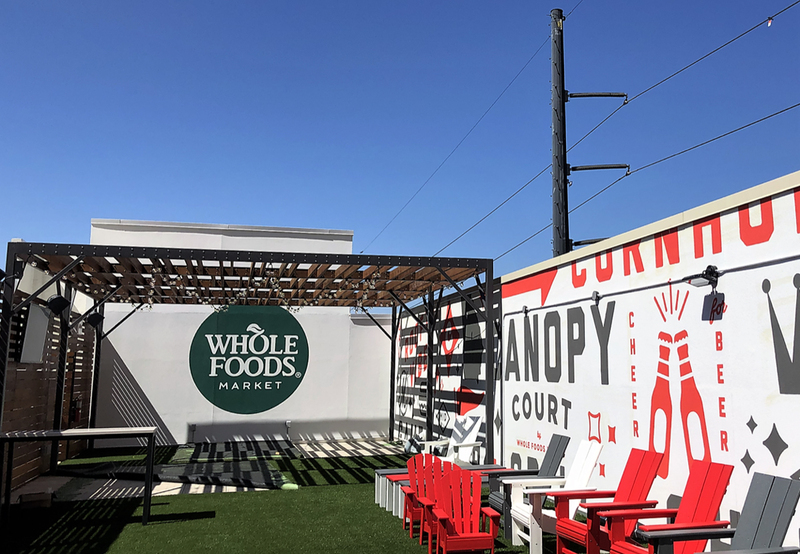 Rooftop Terrace: Open to all ages, the Canopy Court on the roof will have bar and a container-style kiosk for chef pop-ups. There’s artificial grass “to make it feel like you’re hanging out on the BeltLine,” Turner says, as well as games like giant Jenga. There’s stadium seating for movies, trivia, open mic nights, and artist gallery nights, plus plenty of space for Zumba and sunrise yoga. On the last Sunday each month, there will be a rooftop brunch with a chef-curated menu and live music.